A variety of optional features allow for extensive customization of the Genesis Shaftway Model. Highlights of some of the optional features and descriptions are listed below. For a more extensive list of options contact you local Garaventa Lift Representative or refer to the Genesis Design and Planning Guide . Finishes for the Genesis Shaftway model include the steel panels and aluminum extrusions to be painted from a large selection of RAL Colors. 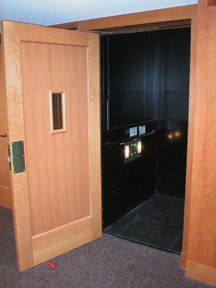 Garaventa Lift can offer custom color matching, Graphic Imaging and Exotic Finishes. The panels can also be supplied with wood finishes, Formica, architectural metals or any material not exceeding 1/2" in thickness. The Garaventa Lift style door and gate are pre-hung in an anodized aluminum champagne colored extrusion frame. They are constructed of 16 gauge powdered coated galvanized steel. The Garaventa Lift Power Door Operator (PDO) automatically opens the door/gate when the platform arrives at the landing. When the lift is at the landing, the passenger can press the call station switch or gently pull on the door or gate to activate the door opener. Power door operators are recommended if the lift has a ramp. Certain applications may limit the use of this operator Consult you authorized Garaventa Lift Representative for which door operator is appropriate for your application. The fire rated door and frame is completely pre-hung and is constructed of 16 gauge steel. The rigid foam filled door has a vision panel and a delayed action door closer. 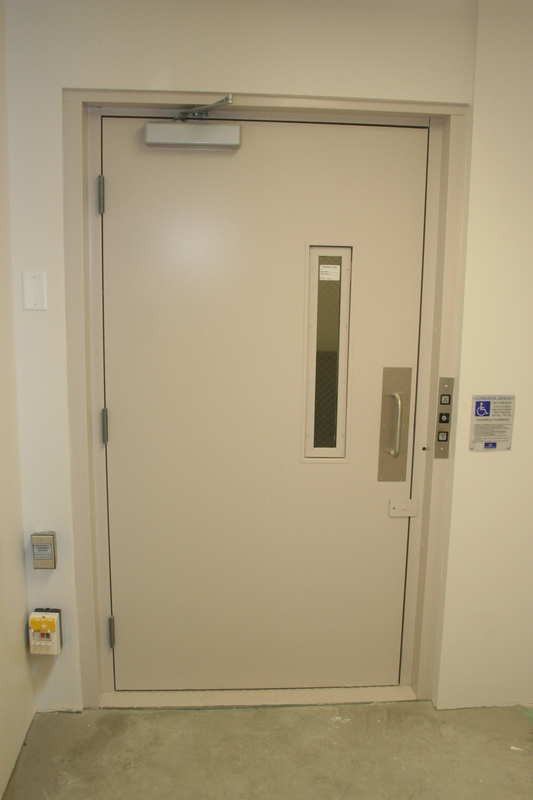 The door and frame have an 1 1/2 hour "B" label fire rating with an integrated interlock system. Illuminated and tactile constant pressure button call stations are available as an option. In situations where the lift must be attendant operated, the call stations can be modified to include an attendant call button. Illuminated and tactile constant pressure button controls are optional. These controls are equipped with an audible illuminated Emergency Stop/Alarm switch and courtesy lights that are activated when the passenger enters the lift and during operation. The platform controls can also be equipped with an optional key switch. The Genesis can be configured for three landings. The lower and middle landings must have a full height door and the upper landing may have either a full-height door or gate. This emergency lowering system is automatically activated in the event of a power failure.